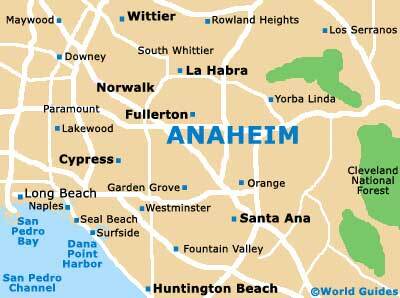 Not many visitors to Anaheim consider going to a park, yet a few minutes to the east of Anaheim and Orange County are numerous scenic areas. Many of the parks in the Anaheim area permit in-season camping for a nominal fee, while the recreational activities at the parks closer to the cities are excellent, with hiking and biking trails, boating and fishing as well as horseback riding all on offer. Located to the southeast of Anaheim and near the edge of Cleveland National Forest in the Santa Ana Canyon, Featherly Regional Park is a beautiful place to spend some time. Camping facilities are excellent, with showers, barbecue areas and playground equipment, while the park also boasts an interpretive center and many hiking trails. Irvine Regional Park is California's oldest county park; the land was donated in the late 19th century by James Irvine. The park is in East Orange County, not far from Anaheim, and is typically Californian with its rustic atmosphere and groves of sycamore and oak trees. Wildlife is in abundance here and there is an excellent nature trail as well as the Orange County Zoo and Irvine Park Railroad. Leisure activities at the park are plentiful and you will find lots of shady spots to picnic. Peters Canyon Regional Park is for the more serious hiker or biker and is crisscrossed with a variety of trails and a winding creek, with a 50-acre lake being the park's focal point. 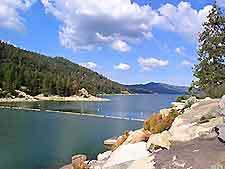 Peters Canyon is set in the hills near Orange and is scattered with native vegetation and willow tree groves. Downstream from Prado Dam and not far from Anaheim, Yorba Regional Park has hundreds of picnic tables and excellent facilities suitable for the whole family including several playgrounds, mountain bike trails, horseback riding and boating and fishing on the four interconnecting lakes. The scenery within the park is outstanding.